It got cold last night in Texas. It has been a typical long, hot summer and the first few days of November came in right chilly like autumn is supposed to. Dan trimmed the cypress tree yesterday, where it was getting dangerously close to the chimney. We checked out the heaters this morning and when the eastern sun finally hit the breakfast room windows, I opened all the shades to let in the solar warmth. 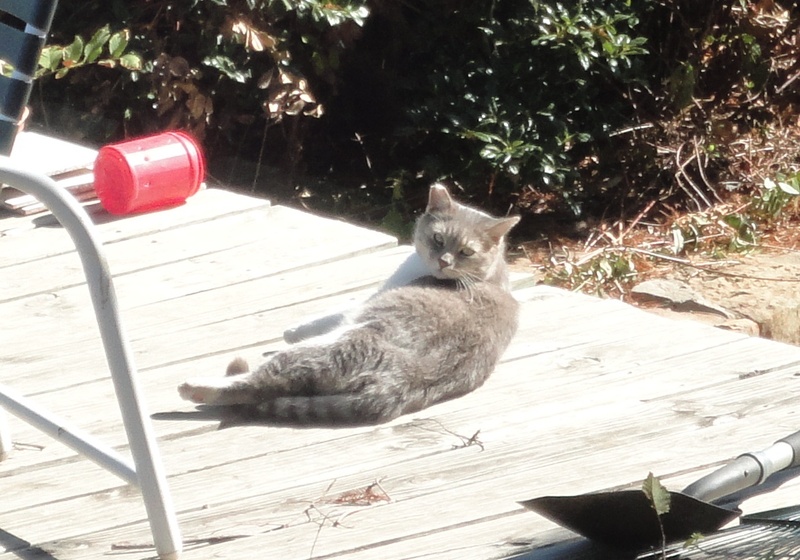 Mr. Tom was soaking up sun as well. 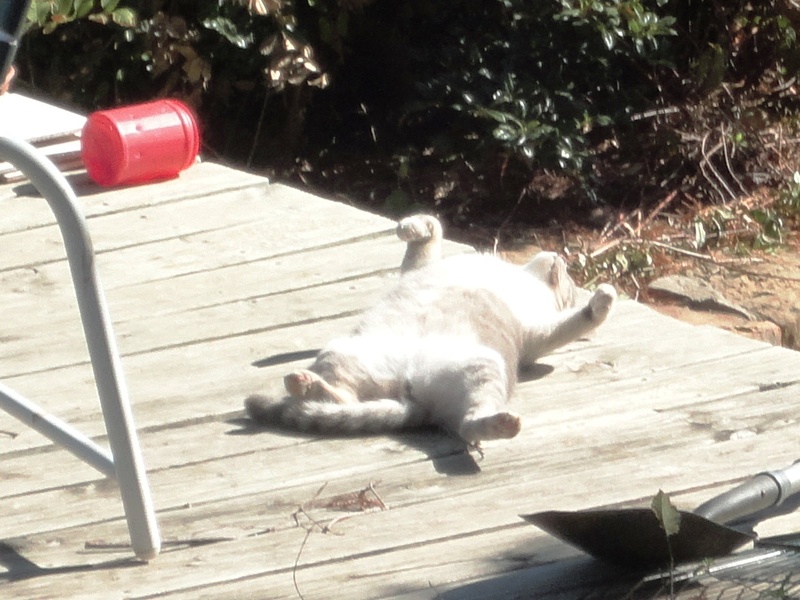 I caught him rolling around on the wood deck, exposing his belly and looking as if it gave him great pleasure. I’m amazed at how this little cat causes me to laugh as I take joy in his simple expression of contentment. Ah, to roll around in the warm sun! 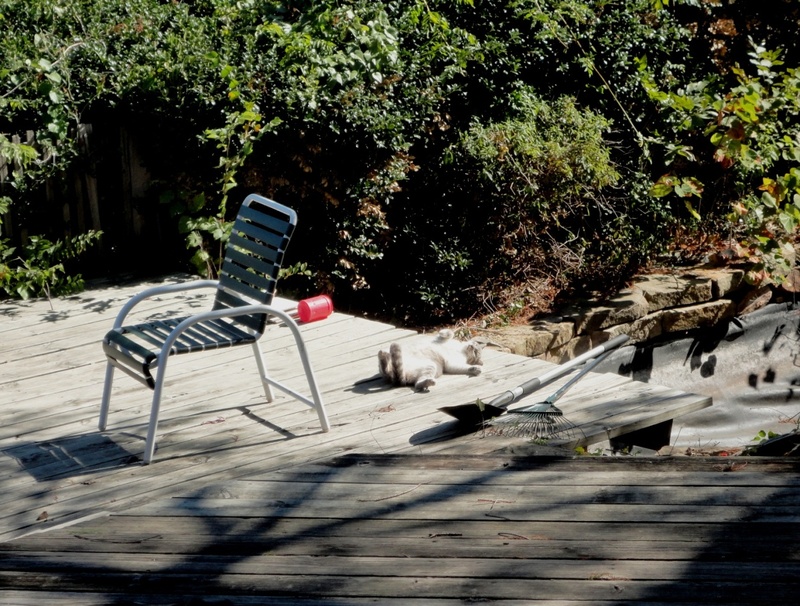 If only I could lay aside my tasks and join him on the deck. I won’t. But I do take a minute to watch and participate by proxy and say a word of appreciation. I’m happy and content, thank you, Lord. November is the month of the American traditional holiday called Thanksgiving. The first pilgrims gave thanks to the Creator for sparing their lives with a bountiful harvest. Thanks to the Wampanoag tribe, the hard-working English had learned to plant crops indigenous to the new land, so it was only fitting they be invited to the celebration. Isn’t this just the nicest thing ever? The Feast lasted a week and, since many of the natives lived a two-day walk away, they built their own temporary accommodations. I suppose the encampment looked a lot like the Jewish Feast of Booths (Succoth) which also coincides with fall harvest. Based on all the hype I see on television, I wonder if Americans give thanks on Thanksgiving anymore. I suppose if they gather at the homes of grandparents, everyone bows their heads for a one-minute acknowledgment before chowing down on turkey and pumpkin pie, kicking back for beer and a football game. Thanksgiving Day in the twenty-first century is a far cry from that week of gratitude and tears of joy over a harvest of winter squash and corn. Forty-five people died the first winter. With plenty to eat, maybe no more would perish from malnutrition and disease. I suppose it takes a morning of clouds and cold wind to make us appreciate the sunshine on a warm wood deck. Quote | This entry was posted in Short Takes on Life and tagged appreciation of little things, Feast of Booths, giving thanks, grattitude, pilgrims, Succoth, the first thanksgiving, Wampanoag tribe. Bookmark the permalink. I, a long with Tom, am grateful everyday for the food before us, the family and friends around us, and the love and warmth between us! Soak it up Tom!